Decorative Life: Many months to years. Member of the Liliaceae (lily) family. Common relatives include tulip, asparagus, lily-of-the-valley, daylily and hyacinth. Long, slender and succulent leaves. From the Arab word, alloch, or the Greek word allal, meaning bitter. A major source of drugs produced mainly in Netherlands Antilles. Used as a home remedy for burns by breaking a fleshy leaf and allowing the gelatinous sap to fall on skin that has been burned. Used in World War I as an antiseptic by placing entire leaves in open wounds and then sewing up the wound. 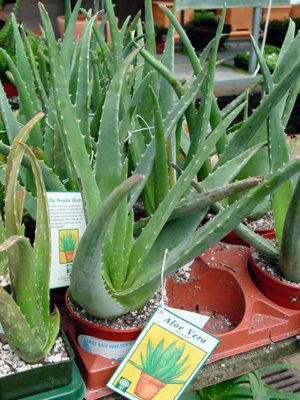 Many so-called America aloes are actually members of the Agave genus. Will generally grow well in light levels bright enough to read a newspaper in comfort. As summarized by Brown (1988) of the work by Wolverton et al. (numerous years), this is one of many foliage and flowering plant species that can remove air pollutants such as formaldehyde and/or benzene often found in cigarette smoke from interior environments.